Power – The control you need to make 100% of the power available from the engine. 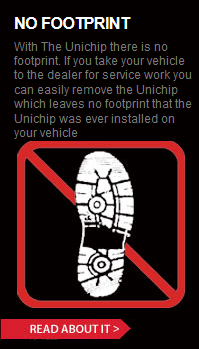 Flexibility – Unlike other products, the Unichip is a universal tuning solution with which a tuner can control timing, fueling, and (if applicable) boost on virtually any vehicle with an ECU upon which to piggyback. Chevy, Mercedes, Toyota, Dodge, etc… diesel, rotary, Otto-cycle it doesn’t matter. You use the same tuning software and the same hardware to interface and control all of them. Control – Add nitrous, water injection, additional fuel injectors to any application and control them through the Unichip for seamless engine operation with minimal driver tasks. Auto switch calibrations when needed. Adaptability – Integrate turbocharger/supercharger systems seamlessly by using the Unichip to provide real time timing and fueling changes based on air flow, throttle position, or a combination of both. Simplicity – Not just engine power but power over the engine for the tuner.